(CNN) -- Watching television does not make babies smarter, according to a study released this week in the journal Pediatrics, adding to existing research that challenges the usefulness of baby educational videos and DVDs. A pediatrician recommends using blocks, puzzles and books to entertain the baby rather than TV. Researchers from Children's Hospital in Boston, Massachusetts, and Harvard Medical School reached this conclusion after monitoring more than 800 children from birth to 3 years of age. "Contrary to parents' perceptions that TV viewing is beneficial to their children's brain development, we found no evidence of cognitive benefit from watching TV during the first two years of life," the authors wrote. Educational DVD and videos geared towards enriching babies and toddlers, such as "BabyGenius," "Brainy Baby" or "Baby Einstein," which proclaim to "encourage discovery and inspire," have no benefits, researchers said. This echoes a similar finding published in the August issue of Pediatrics. Researchers from the University of Washington and Seattle Children's Hospital Research Institute found no evidence of benefit from baby DVDs and videos and suggested that it may be harmful. Infants who watched the videos understood fewer words than those who did not watch them. Pediatrician Dr. Michael Rich, a co-author of the latest study from Boston, calls baby educational DVDs and videos "just wasted time." "At the very best, they steal time from much more productive cognitive developmental activities," he said. "Ultimately, what it's about is to make parents not feel guilty about an electronic baby sitter." The parents of the 872 children in the Boston study estimated the number of hours their toddlers spent in front of the television, including TV programs and DVDs. Researchers did not have data on what kinds of programs the toddlers were watching. On average, babies at 6 months watched approximately 0.9 hours of TV per day. That number increased as the child aged: 1.2 hours at 1 year and 1.4 hours at 2 years. The American Academy of Pediatrics recommends no screen media for children under the age of 2 years. Educational DVDs are tailored for babies as young as 3 months. In the Harvard study, two I.Q.-related tests were administered to the children: the Peabody Picture Vocabulary Test III, which indicates how many words the child understands and uses, and the Wide-Range Assessment of Visual Motor Ability test, which presents puzzles and peg boards to test cognitive abilities. Babies who spent more time watching TV had lower language and visual motor skills at age 3. But when results were adjusted for household income and education levels, the association did not appear. Lead author Marie Evans Schmidt and her colleagues "did not find evidence of harm or benefit of TV viewing." Based on the existing body of research, Schmidt, a developmental psychologist instructor at Harvard Medical School, said, "there's still more evidence of harm than benefit as far as TV viewing in infancy is concerned." Studies exploring the relationship between TV viewing and the effects on children are just beginning, she said. "My hope is that when this information is made available to the general public, that it won't be perceived as study that means there are no harmful effects of TV viewing on infants, because other studies have shown TV viewing at high levels can put kids at risk for some things like obesity, sleep disturbances and possibly attention problems," Schmidt said. Rich, a pediatrician who directs the Center on Media and Child Health at Children's Hospital Boston, said TV watching during infancy instills habits that promote obesity. "You're teaching 4- or 5- or 6-month-olds how to watch TV," he said. "They're learning to watch TV. The more they watch as they get older, they're snacking in front of TV, they're exposed to snack-food commercials, which inspire them to eat even more and sit even more. It is a cumulative effect of many, many factors." But Karen Hill Scott, a senior fellow at UCLA who works in the field of child development, said the criticism ignores real life. "To me, as a scientist and parent, we can't hold on to completely demonizing screen time when parents are really very determined to use it." Modern parents "want kids to be literate on computers. They don't see the screen media as evil," said Scott, a consultant for Baby Einstein. "The net effect that it's not harmful is a relief to many families who have been made to feel guilty or awful that they use screen time." MayoClinic.com: What happens from 7 to 9 months? Scott said the material in educational baby DVDs is similar to what is in books. Baby Einstein products were designed by Julie Clark, a teacher and mother, and were not devised through scientific research. 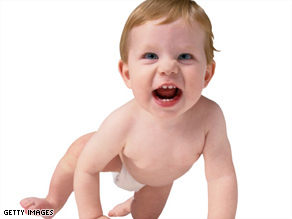 Susan McLain, general manager of Baby Einstein, said the company receives thousands of letters from satisfied parents. "We've basically stayed true to the philosophy to what [Clark] created. That was exposure to real-world imagery," she said. "The core themes are art, music and nature; that's the core essence of what we've created." She said the Harvard study indicated that "screen time is not harmful for baby and infants." Rich, the study co-author, recommended relying on what has been proved to benefit children. "The best thing for our kids is to provide them with stimulus that we know is positive for their brain development," Rich said. He suggesting activities like reading, singing, interacting and stacking blocks to help children.